Originally published by Catch News on 07/02/16. Every so often in India, the spotlight shines on the negative impact of mining on the environment and on the human beings closest to nature, the tribals. And then, seemingly within seconds, life goes on as usual. There’s a school of thought that says in a country like India, which needs a tremendous amount of resources for its 1.3 billion people, some trees or a patch of ground is a small price to pay for development. The tribals obviously don’t agree. It’s not just a question of affecting what’s holy to them, but also of their very existence. Just last week, to coincide with Republic Day, the Khandadhar Suraksha Sangram Samiti and NGO Lok Shakti Abhiya organised a three-day satyagraha at the foot of the Khandadhar waterfall in Odisha. Both organisations allege that the government is all set to sell the waterfall and the remaining land in the Khandadhar hills to foreign mining companies, which will affect 30,000 people belonging to the Pauri Bhuiya tribe. The tribals have demanded a ban on mining in a 25 km radius around the waterfall. But are these adivasis standing in the way of modernisation and development? The blaring loudspeaker at a tea stall outside the Rourkela railway station was the first reminder that it was Republic Day. Little tricolours flew atop electricity poles all along National Highway 23, and children were spotted gaily flying the flag till we reached Rajamunda. The scene changed as we turned on to NH-215 to reach the famous Khandadhar waterfall, the 12th highest in India. There were no further reminders of nationalistic fervour till we got to the 800-foot fall. At the bottom stood a colourful camp, inside which were portraits of Mahatma Gandhi and tribal icon Birsa Munda. There was an unknown image placed between them, which seemed to mock our limited understanding of the world’s biggest republic. It turned out to be a representation of Kankala Devi, the goddess revered by the Pauri Bhuiya tribe. The deity has a legend similar to the mythical king Niyam Raja, who is worshipped by the adivasis of the Niyamgiri forests. Anthropologists have established a genetic link between the Pauri Bhuiya tribe and the Jarawa tribe of Andaman. Both groups had common ancestors around 24,000 years ago. But while there are less than 500 Jarawas left, the Pauri Bhuiya tribe has thrived around Khandadhar region since time immemorial. But now, the 30,000 Pauri Bhuiyas are ready to wage a final battle for their survival. The hills of Khandadhar are not new to mining; in fact, they have been mined for nearly a century now. But the area around the waterfall has escaped the ravage so far. On the eastern side of these hills lies the Keonjhar district, while the western part is flanked by the Sundargarh region. The Tata family has derived much wealth from its Jamshedpur empire thanks to mining activities in the Keonjhar and Mayurbhanj districts. 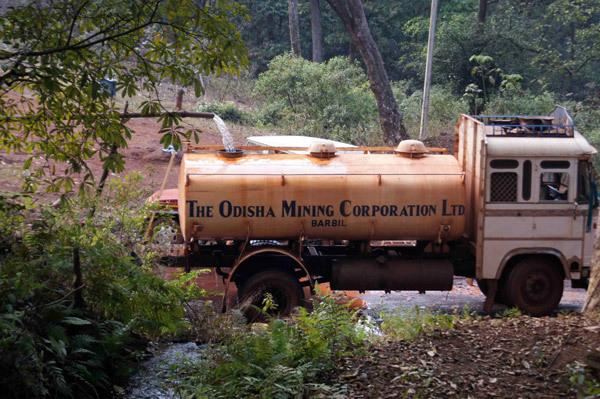 The Odisha Mining Corporation (OMC) owns 133 hectares of mining land in the Kurmitar hills of Khandadhar. The path to the waterfall from the Sundargarh hills passes through this area. Not even locals are allowed to step onto this land. They have to take alternate routes to reach their villages. Subendra Nath Malik owns the Happy Home Hotel in Bonaigarh block, adjoining Khandadhar, and knows the area like the back of his hand. He has been teaching adivasi students for over four decades, and has even earned a President’s Medal for his services. According to him, the Khandadhar waterfall emanates from Gonasika area of Keonjhar. The water course turns into the Kuradi nullah after this waterfall. There was a time when the Kuradi nullah kept the Brahmani river flowing through the whole year. However, the stream no longer reaches the river because of mining activities along its course. Water theft for mining and unabated blasting has dried it up. The fact that the waterfall dives into OMC-owned land has not helped matters either. Malik remembers his childhood, when the Brahmani river surrounded Bonaigarh on three sides. The town resembled an island in those days. Today, there are few clues which can corroborate Malik’s recollections. One can only imagine the consequences if 6,000 hectares of land in Sundargarh is opened up for mining. This is the predicament that the Pauri Bhuiya and other tribes find themselves in. Local residents have been fighting a battle against mining since 2005. That was the year when the state government allotted the Khandadhar iron ore mines to South Korean company POSCO. Their struggle was not in vain, as the contract was eventually cancelled. But the same mines have now been opened for auctioning under the amended Mines and Minerals (Development and Regulation) Act (MMDR Act). Earlier, it was only POSCO. Now, other companies are also free to join the plunder of natural resources. And all this is without the consent of the gram sabhas, which goes against the guidelines laid down by the Supreme Court in the Niyamgiri case. 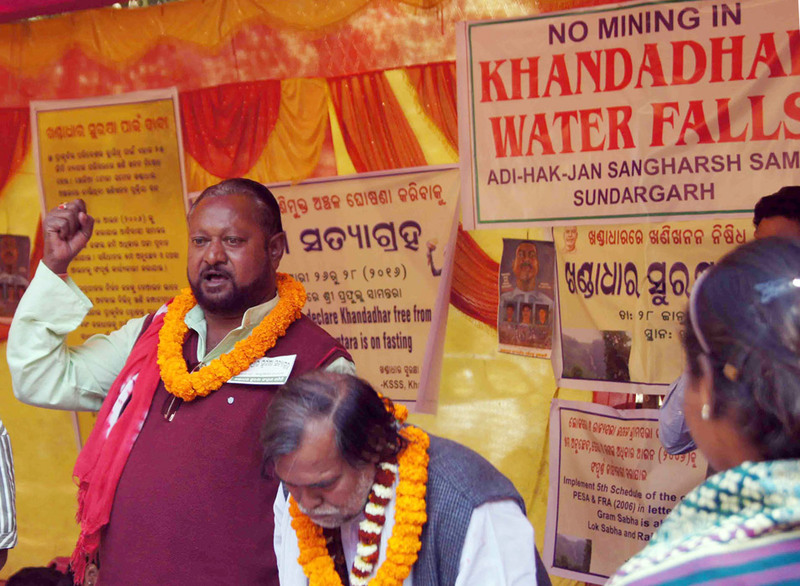 In October 2014, representatives of various land, water and forest rights movements had congregated for an all-India convention at Dhinkia village in Jagatsinghpur. The convention issued a manifesto, calling for a united struggle at Khandadhar. Some of those activists met again at Khandadhar on 26 January at the camp where Kankala Devi’s image was placed. They had some harrowing tales of exploitation to share. Lado Sikaka, the leader of the Dongria Kondh Adivasis of Niyamgiri, was among these activists. On 27 January, Sikaka and his followers decided to leave the gathering to explore the hills. The people at the camp were worried when Sikaka did not return in the evening. However, Sikaka was found outside the camp next morning, savouring local delicacy Chura. He looked upbeat after meeting the tribals uphill. “They have assured us not to worry. All of them are with us,” Sikaka informed in his native Kui dialect. The same optimism reflected in the body language of Pauri Bhuiya leader Bilua Naik while facing TV cameras on the last day of the Satyagraha. Lado Sikaka confesses that Khandadhar hills are even more beautiful than Niyamgiri. They are indeed, but only till your vantage point is along the World Bank-aided metalled roads. The devastation becomes clearer as you go closer. The layer of dust thickens as you climb up the hills. The leaves turn gray and everything you see is engulfed in dirt. The landscape resembles an ongoing archaeological dig or a heavily industrialised city as one approaches Barsuan. This is the place where iron ore is sent to refineries through railroad. Tonnes of ore from the Bhutada mines, belonging to the Aryan Mining & Trading Corporation (AMTC), reaches Barsuan railway station every day. It is transported downhill to Bonaigarh, where around 11 sponge iron factories are functional. There are 14 companies like AMTC which have mining licences in the area. The forest plateaus out as you move further upward from Barsuan. A huge ‘OMC’ gate stands outside this patch of land, and outsiders are strictly prohibited from entering the gate. The private security guards at the entrance cite ‘security reasons’ for this ban. They tell stories of visitors who had died while trying to peek at the waterfall below. But that’s not all. 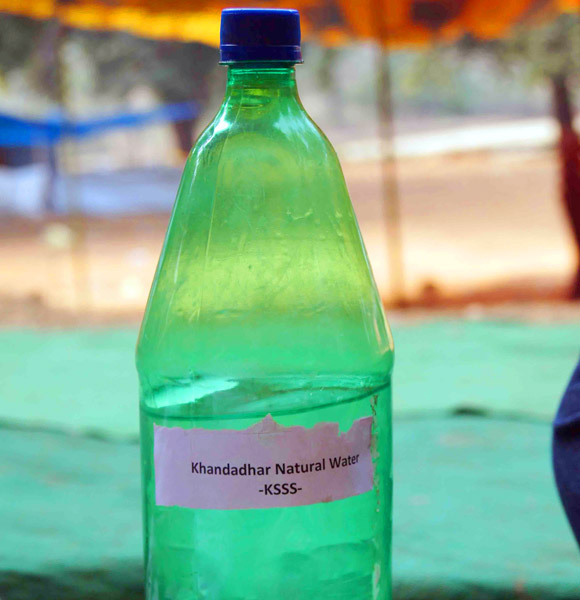 The OMC has used pipelines to divert water from the place where the Khandadhar waterfall starts. It quenches the thirst of the company’s own township, and for filling its tankers and washing vehicles. Nobody is allowed to go further up to this diversion point. The authorities say it is to prevent the risk of accidents from trucks coming with iron ore. The mines may lie in Keonjhar, but for five decades, Sundargarh has also suffered the pain of destruction. Dayal Munda runs a temporary canteen, just 500 meters from the OMC entrance gate. He rues that locals are increasingly deprived of livelihood opportunities. “OMC offered me a driver’s job long time ago, but I refused. I made my living by doing menial tasks. Now, I have opened this canteen,” he says. According to Malik, only a small portion of the local population have found jobs in the forest depot or mining operations. Others are completely dependent on natural resources for survival. The impact of urbanisation and industrialisation is more pronounced among Pauri Bhuiyas as compared to the Dongria Kondh population. As a result, the political mainstream is more involved in their struggle. Sundargarh MP Jual Oram of the BJP was the undisputed leader of the fight against POSCO. But now, he has been silenced with a Cabinet berth at the Centre. Local independent MLA George Tirkey has emerged as his replacement. 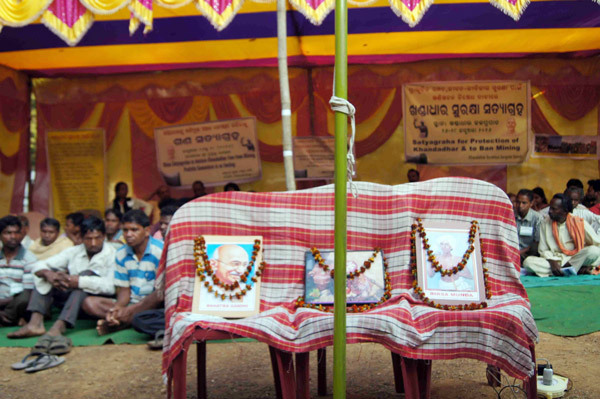 The satyagraha at hand was organised by the local tribals, led by Prafulla Samantara, who has been one of the primary campaigners against mining in the last two decades. But, it was Tirkey who broke Samantara’s fast with a glass of juice on 28 January. Large hoardings of Tirkey on the protest grounds and the way he hogged the limelight suggests this battle is not so simple. According to tribal mythology, Pauri Bhuiya tribals once stole the Khandkumari deity from Keonjhar, to escape Kankala Devi’s wrath. They wonder who will save them if Khandkumari’s region is itself ravaged. “It is only the local people who can save Khandadhar from becoming Raktadhar (stream of blood),” announces local tribal Mundari Dehari with a wry smile.